Tyres of landing aircraft deposit rubber on the surface of runways. These rubber deposits cause reduced friction values, leading to inadequate tyre contact. If this occurs, the runway may need to be taken off-line, leading to reduced airport efficiency. With increasing demand for air travel, the time for maintenance and runway cleaning is critical and precious. Our process allows time-efficient, environmentally friendly runway cleaning. In order to ensure high environmental care and low water consumption, only clean potable water without chemical additives is used. Traditional rubber removal techniques simply cannot compete with our 36,000psi (2,500bar) ultra high-pressure water jetting technology in terms of rubber removal effectiveness, speed and the quality of the surface left behind. 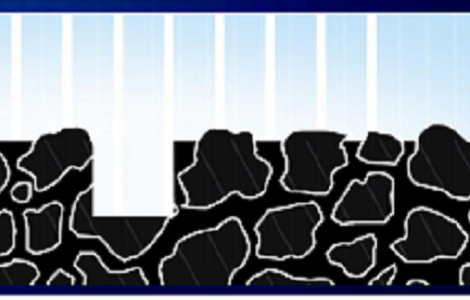 Almost 100% of the rubber in the designated area is removed, providing the best possible friction values with no measurable damage to the grooved or un-grooved pavement surface. Our UHP Water Jetting system, combined with an integrated extraction vacuum system, operates at any pressure between 800 and 2,500 bar. Our ultra high pressure water jets get deep into runway grooves, leaving the runway clean with an increase in friction values. Water jets allow for complete removal of rubber and debris, without damaging the runway. Depending on the construction and condition of the runway, the right pressure is chosen in order to save the micro and macro texture of the surface. The significant advantage is gained by the combination of using low volumes of water (1litre/jet/min) and ultra high pressure. 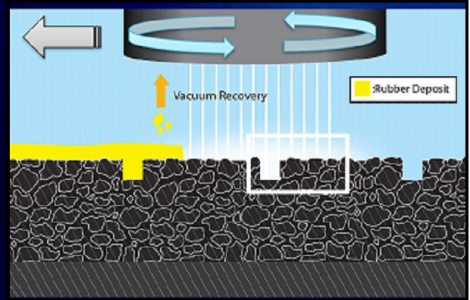 Debris and dirty water resulting from the rubber removal operation are deposited into a tank integrated into the unit, with a separate tank for fresh water storage. Such arrangements allow maximum utilisation of valuable time on the runway. Minimal to no wear to runways. Does not create messy residue (integrated vacuum recovery). Cleans deep into the runway grooves.